We have spent several Christmases on the island of Ynys Mon, otherwise known by its Viking name of Anglesey, in North Wales. The weather in December always throws up surprises. On our last trip this was one of them – a perfect, windless, cloudless day with warm sunshine. 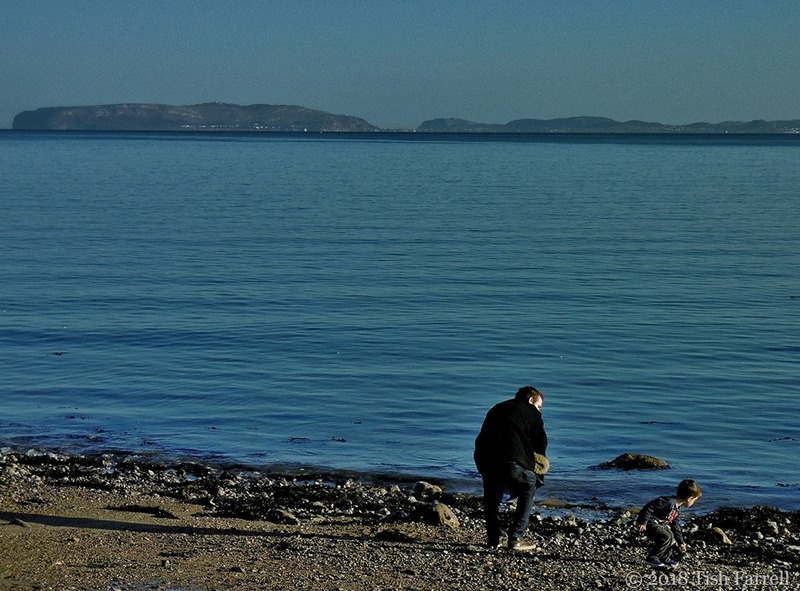 We wandered on the Menai Straits beach, looking out at the Great Orme peninsula at Llandudno across the water. I found myself watching this young man and his little boy, so absorbed in their play, the sun catching winter-white faces. No sound but the call of an oyster catcher. That day in that place, we felt the universe had just given us a gift. 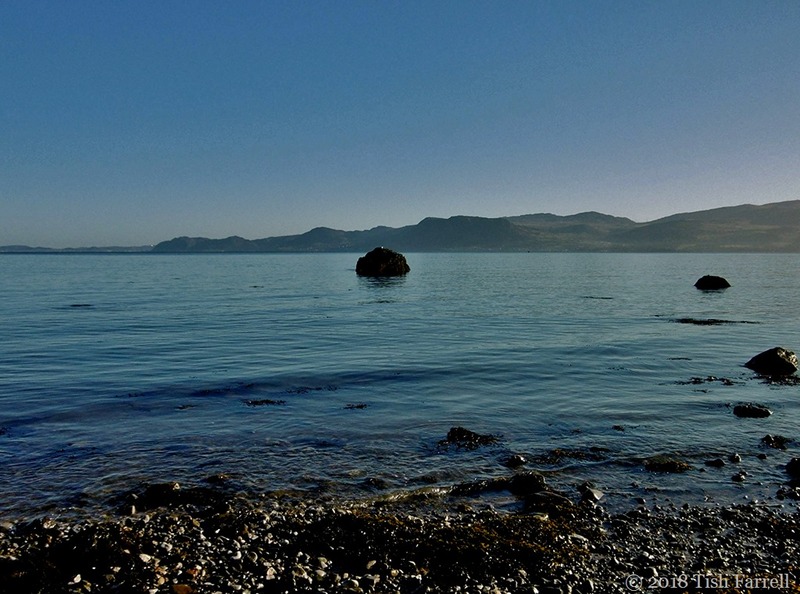 Posted on August 6, 2018 by Tish Farrell	This entry was posted in Travel, Wales and tagged #Lens-Artists, Anglesey, blue, Menai Straits, Tish Farrell Writer, Ynys Mon. Bookmark the permalink. Thanks, Lisa. It is a lovely place. In stormy weather too. Yes it does look like another one of nature’s generous gifts Tish, how wonderful! Oh yes, that light. No wonder the Druid mystic women took up residence here. Thank you, Sue – it’s making me feel better too. A bit Monday-morningish today. It looks very peaceful. Lovely selection of photographs for the challenge, Tish. Have a great week. You too, Isadora. Thanks for commenting. Too easy to be ungrateful, I find. Serenity and tranquillity are dominant elements in your amazing photos, Tish! I felt the receipt of that gift too, one day on Anglesey, Tish. 🙂 🙂 Thanks for taking me back so beautifully. It was the title to this post that tempted me to open and read, even though I felt too weak to really enjoy any reading right now. Blissful… how wonderful. I wasn’t disappointed. Bliss is so subjective, and even so, I got a taste of it. Are you not very well, dear Shimon? Am feeling very out of sorts myself, despite the blissful blue. Wishing you health and strength. Thanks very much Tish. I am old and weak, and occasionally forget my limits… and then it’s hard for me to get back in shape.Don’t worry. I accept my fate with equanimity. I admire your philosophical perspective. And I am curious as to what the call of an oyster catcher is like? Oh and nice take on blue…. So calm and serene a scene! Lovely, tranquil blues, Tish. The Welsh language always amuses me with its interesting combination of consonants and its impenetrable pronunciation. When the actual pronunciation is given, I’m always bemused at how it comes out that way. 🙂 Part of the fun. Irish/Gallic seems to me to be the same. So soothing, peaceful and lovely. Hi Tish! I’m so cross that I didn’t get over to Anglesey whilst I was living in Shropshire. But grateful that I can share in your visits. Happy to share. You could go on the train?! A sort of safari. It could take days. It really could! Takes OH all day to get to Shrewsbury with 3 changes! http://www.walesonrails.com/ It seems to cover some v. scenic terrain. Heaven knows where you’d catch it from Cornwall. I quite fancy that Welsh Riviera weekend – we actually had our honeymoon (1 night) in Portmeirion! Nice spot for a honeymoon. Scene of many childhood hols too. A very quirky place and we loved it! Great hotel too (though not cheap). Never stayed in the hotel, though often fancied it. They have Festival No 6 there every year – v. whacky and wonderful so it seems, and inspired by The Prisoner that of course was filmed there. I never watched the Prisoner, though I remember the ball. I’ll just pretend it’s summer, then it’ll be blissful! It was actually almost as warm as a normal UK summer, which was a bit weird. Perfect light, and the tranquility caught in the moment. Beautiful. Very blue. Or maybe it was the bluefulness of bliss? I like it – bluefulness!